We’ve always felt that it was such a shame to just throw out plastic bottles in the recycling. There has to be something we can re-use them for, right? 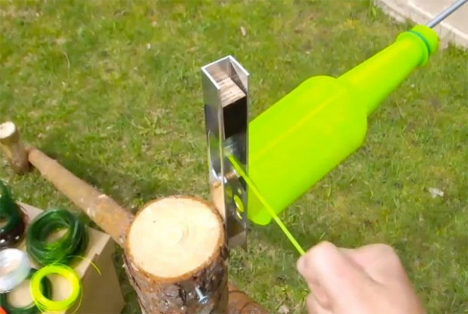 A Russian DIY-er has invented a genius device that turns plastic bottles into plastic string with virtually no effort. 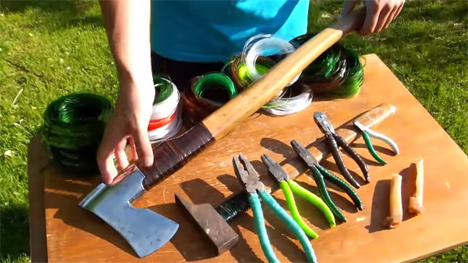 Going by the YouTube name of Адвокат Егоров, the inventor shows not only how to make the string, but how to make your own bottle-reusing device. The video shows that the device is capable of making the string in several different thicknesses. The inventor has used the string for a number of applications, but one of the most impressive is a fishing line replacement. He also shows how to use it for wrapping tool handles, replacing the low-quality and easily-ruined rubbery covers that come on the tools. After wrapping the handles – or using the plastic string to tie objects together – the application of heat makes the shrink a bit and pull tight, increasing its strength and durability. The clever use of this readily-available material makes us wonder if it could be used in 3D printers to replace standard plastic filament, thereby reducing the need for newly-produced product and somewhat easing the scourge of waste plastic.